CALGARY, July 19, 2011 /CNW/ - Bellatrix Exploration Ltd. ("Bellatrix" or the "Company") is pleased to provide the following operational update. Commencing the first week of July, 2011, the Company estimates field production at 4,415 bbls/d of oil, condensate and NGLS and 44.20 mmcf/d of natural gas yielding approximately 11,783 BOE per day. Sales volumes in the second quarter of 2011 are estimated to have averaged approximately 11,643 BOE per day (weighted 38% to oil, condensate and NGLS and 62% to natural gas). This represents a 15.5% increase from the first quarter 2011 average production of 10,084 BOE per day. Bellatrix estimates that the wet weather conditions reduced second quarter production by approximately 300 BOE per day. In addition to the production disruptions, the Company has experienced delays in drilling and completion activities due to the very wet field conditions. The Company has drilled two gross Cardium wells (1.71 net) in the second quarter of 2011. The first well (0.71 net) was completed and brought on production on July 3, 2011 with an IP average rate for 7 days of 945 BOE per day. The second well (1.0 net) is waiting on completion which is scheduled for the week of July 18, 2011 assuming drier conditions. In the second quarter 2011, the Company also completed one gross well (0.33 net) that was drilled in the first quarter of 2011 and was brought on production on June 16, 2011 with an IP average rate for 7 days of 667 BOE per day and an IP average rate for 15 days of 485 BOE per day. As previously disclosed in the Company's First Quarter 2011 Report, as a result of the successful completion of the May 2011 equity offering, Bellatrix revised its capital expenditure budget for 2011 from $100 million to $170 million, which includes the $59.1 million spent in the first quarter of 2011 on capital expenditures. Bellatrix will use cash flow, the proceeds of the financing, and to the extent necessary, bank indebtedness to fund its 2011 capital expenditures budget. 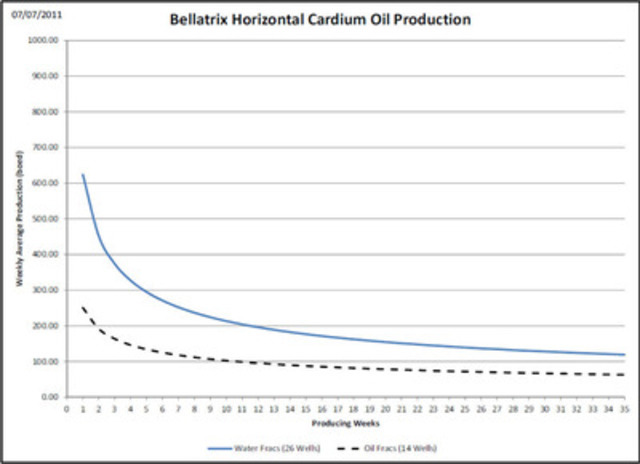 As a result of the expansion of its 2011 capital program, Bellatrix revised its guidance on 2011 exit production from 13,000 BOE per day to 15,000 BOE per day. The ongoing wet field conditions has also delayed the start of the Company's second half 2011 program by approximately 4 weeks. This later than anticipated start is expected to delay the timing of the proposed second half 2011 expenditures and will result in a delay in the timing of bringing on production for the second half program wells. The aforementioned delays have eroded the built in buffers to our 2011 guidance, however, Bellatrix is maintaining its previous guidance for 2011. Based on the timing of proposed expenditures, downtime for anticipated plant turnarounds and normal production declines, execution of the 2011 budget is anticipated to provide 2011 average daily production of approximately 12,000 BOE per day and an exit rate of approximately 15,000 BOE per day. The 2011 capital budget is expected to be directed primarily towards horizontal drilling and completions activities in the Cardium and Notikewin resource plays. The Company will have four rigs drilling Cardium horizontal wells in central Alberta and is on track to fulfill its drilling goals for the remainder of 2011. Bellatrix currently plans to drill 37 gross wells (26.66 net) commencing in Q2 through Q4 2011. The Company expects to drill approximately 32 gross Cardium horizontal wells (25.07 net), 5 gross Notikewin horizontal wells (1.59 net) in the West Central area of Alberta in the second half 2011 program. Bellatrix continues to focus on the development of its core assets and conducts exploration programs utilizing its large inventory of geological prospects. As at June 30, 2011, Bellatrix has approximately 218,067 net undeveloped acres in Alberta, British Columbia and Saskatchewan with in excess of 700 exploitation drilling opportunities identified, representing over 10 years of drilling inventory based on annual cashflow. The Company continues to focus on adding Cardium prospective lands. Forward looking statements: Certain information set forth in this news release, including management's assessments of the future plans and operations including drilling plans and timing thereof, timing of completion, testing and tie in of new wells, the effect of wet field conditions, 2011 capital expenditure budget, nature of expenditures and method of funding thereof, expected 2011 average production and exit rate, may contain forward-looking statements, and necessarily involve risks and uncertainties, certain of which are beyond Bellatrix's control, including risks associated with oil and gas exploration, development, exploitation, production, marketing and transportation, loss of markets and other economic and industry conditions, volatility of commodity prices, currency fluctuations, imprecision of reserve estimates, environmental risks, competition from other producers, inability to retain drilling services, incorrect assessment of value of acquisitions and failure to realize the benefits therefrom, delays resulting from or inability to obtain required regulatory approvals, the lack of availability of qualified personnel or management, stock market volatility and ability to access sufficient capital from internal and external sources and economic or industry condition changes. Actual results, performance or achievements could differ materially from those expressed in, or implied by, these forward-looking statements and, accordingly, no assurance can be given that any events anticipated by the forward-looking statements will transpire or occur, or if any of them do so, what benefits that Bellatrix will derive therefrom. Additional information on these and other factors that could affect Bellatrix are included in reports on file with Canadian securities regulatory authorities and may be accessed through the SEDAR website (www.sedar.com), or at Bellatrix's website www.bellatrixexploration.com. Furthermore, the forward-looking statements contained in this news release are made as of the date of this news release, and Bellatrix does not undertake any obligation to update publicly or to revise any of the included forward looking statements, whether as a result of new information, future events or otherwise, except as may be expressly required by applicable securities law.